Our team has been working for almost 6 months and testing out various method and systems to somehow create a method which would not break any addmefast rules and will gain the highest amount of points per minute finally we came to this powerful strategy that will make 100-200 points/minute without any flaw. Got 127 recommendations out of 288 thumbs up what do you think I have been working on Addmefast for a long time now and have been a social media promoter for almost a year now. I have been in internet marketing for almost 6 years now. I am personally using this strategy and making thousands of points without any hassle. Increase your social media profile reputation. This will help for promote your,General videos, Affiliate marketing promotion,Branding promotion Etc. Order will be made after 12-24 hour after delivery donot ask for immediate delivery its an online delivery so we have to confirm setup time first. 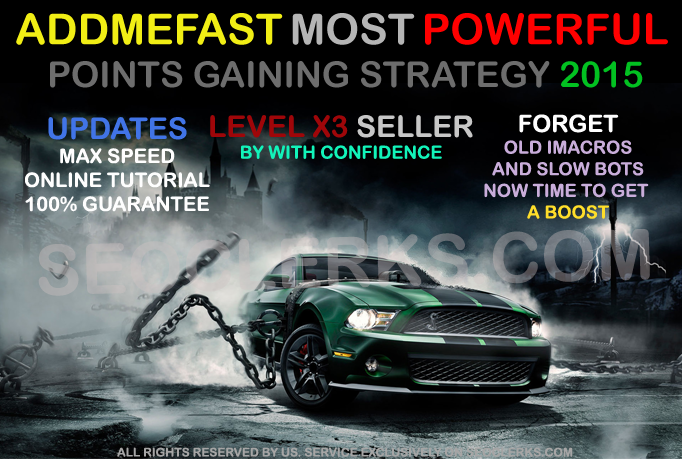 Addmefast points powerful Points gaining strategy ( Rankings Methods included ) is ranked 5 out of 5. Based on 45 user reviews.